US action adventure drama, The Librarians is back for a second season on the Universal Channel next month. Following the success of the first season, The Librarians returns with Noah Wyle reprising his role as the quick-witted librarian Flynn Carson and Rebecca Romijn as his guardian, Eve Baird. Joining them are Christian Kane, Lindy Booth and Australian John Kim as the newest generation of Librarians and protectors of the world’s mystical treasures; and Emmy-winner John Larroquette playing their reluctant, yet supportive caretaker, Jenkins. 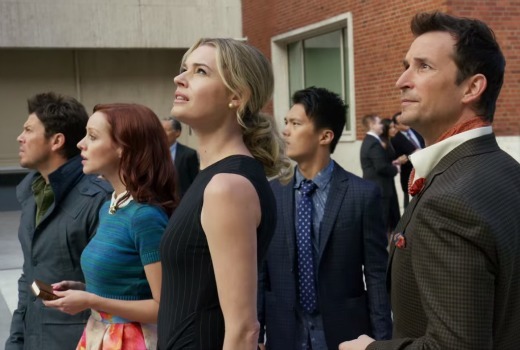 The Librarians centres on an ancient organisation hidden beneath the Metropolitan Public Library in New York dedicated to protecting an unknowing world from the secret, magical reality hidden all around. The first season concluded with the Librarians surviving the Serpent Brotherhood’s evil endgame to introduce magic back to the world. In season 2, having been separated for months, this eclectic group of characters is drawn back together to solve the mystery when a storm descends on Manhattan. They must learn how to work together again as a team – facing up to some hard truths about themselves – all while continuing to collect and protect the powerful artefacts housed in the Library and, more importantly, preventing them from falling into the wrong hands. The Librarians…saving the world one story at a time. Thursday, November 5 at 8.30pm on Universal.